You can check out some of the photos in my set at Flickr. Those of you who couldn’t make it this time, don’t worry, there will be many more Stylehive events in the coming year! 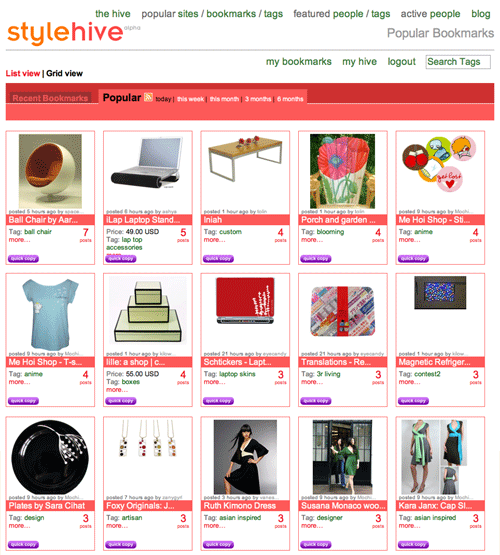 Stylehive has been our client for the past year and launched an alpha in March. We’ve enjoyed a great collaboration with them as their design team, working with them in an agile and iterative fashion, steadily developing and releasing new features, enhancements, and social aspects for members. With this launch comes several cool new features, including follows, wishlists, grid views and a new flash badge. Follows allows you to keep up with your favorite Hive members and their activities in the Hive, whether it’s their bookmark recommendations, who they’ve been following, or new wishlists they may have added. Of course, you can also see who’s following you. As is the etiquette-du-jour on social sites, reciprocation is encouraged but not required :) Follows is a perfect way to discover new people based on their particular style and flavor of bookmarking. 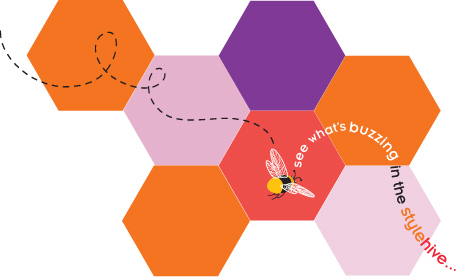 Just click the “Follow this” button anywhere you see in the Hive. You can follow me by going to www.stylehive.com/emilychang and clicking the “follow this person” button. Once you’ve started following people, you can grab the RSS feed or get a daily or weekly email update of your “follows activity”. The RSS feed essentially becomes your curated magazine of interesting people and bookmark recommendations. Of course, you can also jump around the Hive and grab other member’s magazine feeds. Stay tuned for lots of growth in this area as we unveil more features and customizations for personal magazines. 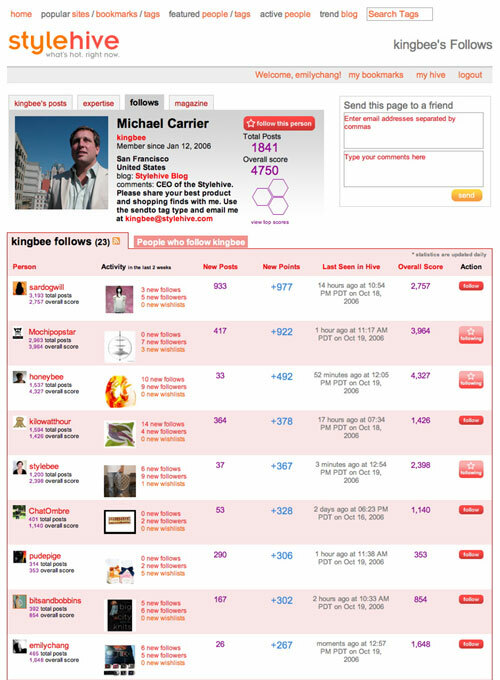 Read the Stylehive blog post about Follows. Wishlists are perfect for the holidays and for keeping track of the things you desire. I’ve got a few wishlists going but plan to add others. Use them as shopping registries, gift lists for friends or family, quick copy your friend’s entire wishlist and edit to create your own. Of course, you can build your own wishlist and share it with friends so people know what you really want. Read more about this at the Stylehive blog post. This is one of my personal favorites. After months of growing membership, the amount of data was also growing exponentially. Grid views lets you to scan bookmarks quickly by visuals and it’s one of the best ways to surf for products to “quick copy”. The Stylehive flash badge widget displays images of your bookmarks with options for showing certain tags, transitions, background colors, and vertical or horizontal badge alignment. Just bookmark your favorite gadgets, fashions, books, accessories, and trends and then tell the widget which tag to display. You can show a rotating stream of your favorite images from all your bookmarks, or from specific tags like “fashion” or “shoes”. It’s easy to set up and add to your blog or site. You can see mine on my about page. 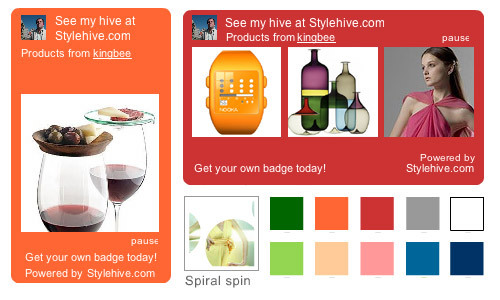 Check out the Stylehive blog post and get your own badge here. Lastly, if you like contests, here’s a fun one for you. Invite a friend to join the Stylehive community during the month of October and you’ll be entered for a chance to win a $500 shopping spree at Stylehive top retailers. Hope you enjoy and let me know what you think. Happy Hiving!